For players interested not only in classical, but also jazz, rock, or funk, the convenience of being able to play in a practice room plus the mobility to take the D1 anywhere is key. On top of that, a carefully fine-tuned playing feel is crucial. 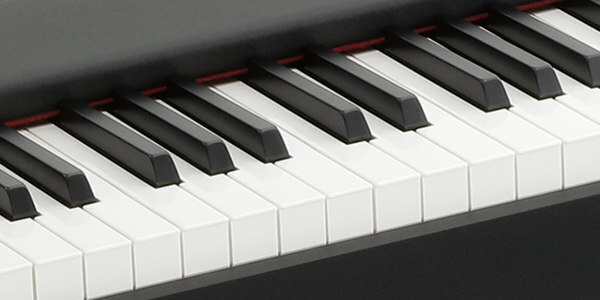 The D1 is a piano that delivers on all counts for pianists and keyboardists of any genre. A compact body that you can take anywhere. 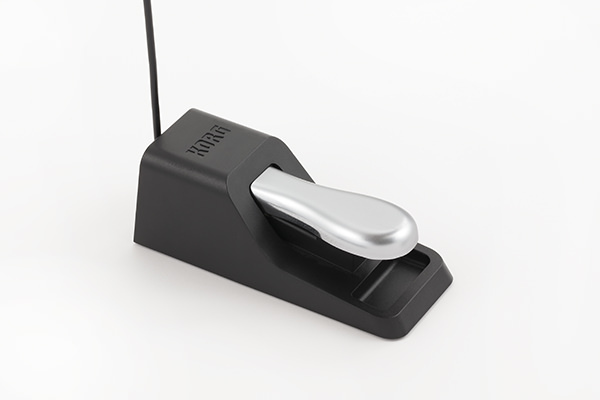 In addition to standard-sized LINE OUT jacks, MIDI IN/OUT connectors are also provided. Music rest and dedicated pedal for stage play also included. 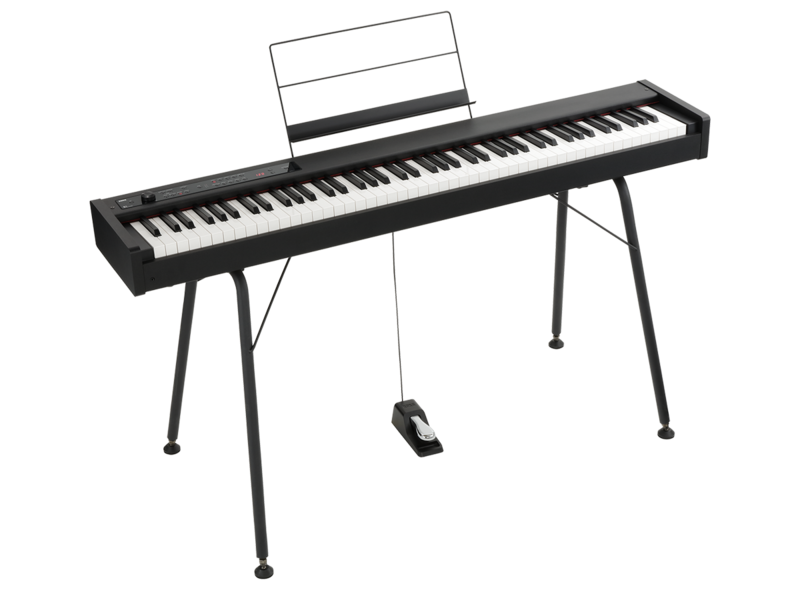 The D1 features a real weighted hammer action 3 (RH3) keybed that reproduces the touch of a grand piano, where the low notes are heavier and the action becomes lighter as you play toward the higher notes. 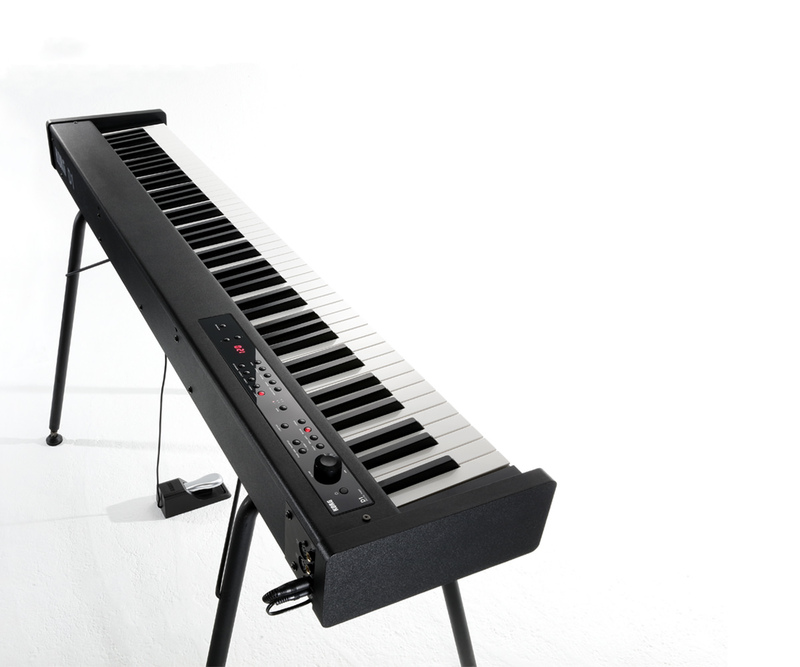 With this keybed's natural-feeling touch and weight, you'll want to keep playing it forever. The chassis construction has been rethought with a new structure and design that slims the body to a depth of approximately 26 cm* (10.24"), the minimum depth that still allows enjoyable playing. Even though the D1 features a full-fledged weighted keybed, it's highly mobile, and can be carried anywhere in its dedicated SC-D1 soft case (sold separately). The stylish ST-SV1 stand (sold separately) completes a great-looking setup on stage or in your room. 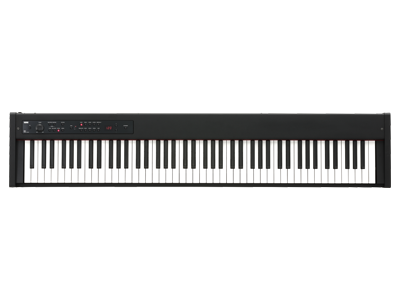 The D1 contains a total of 30 richly expressive sounds which include not only a variety of piano sounds to cover genres such as classical, jazz, and pop, but also electric piano, organ, and clavi sounds that will be useful on stage, and even sounds such as vibraphone, acoustic guitar, and strings. In order to achieve a playing feel that's amazingly close to that of an acoustic piano, the sound switches between four piano samples depending on the dynamics of your performance. From a delicate touch to dynamic fortissimo, the sound responds realistically to your playing. The overall piano sound is enjoyable to play and delivers an authentic experience. The electric piano sounds reproduce not only the tonal differences in response to your playing touch but also the key-off noise. Six variations are built in, covering sounds often used in the popular music of the '60s and '70s as well as tones that are treasured in soul music. Six versatile sounds are provided, ranging from sounds used in rock or jazz to solemn pipe organ tones. The Concert Piano, Grand Piano and Jazz Piano sounds reproduce damper resonance, realistically simulating the spacious resonance produced by the sympathetic vibration of the strings when you hold down the damper pedal of an acoustic piano. The D1 also simulates the decay of the sound when you take your finger off a key and the way in which your playing technique affects the string resonance, responding to staccato or legato in a natural way that further enhances the expressiveness of your performance. The metronome can be turned on/off at a touch. Layer mode lets you layer two sounds simply by pressing two sound buttons simultaneously, for example letting you combine strings or vibraphone with the piano sound that you're playing. The touch control function lets you choose from five settings (light, standard, heavy, stable, fixed) to specify how the sound responds to your playing dynamics, allowing you to enjoy performing with the response of your choice. Three high-quality effects are also built-in: brilliance, reverb, and chorus. The optimal effect for each internal sound is already specified as a preset, so you can simply select a sound and focus on playing it with the best possible tone. The D1 provides the external connection jacks that you'll need on stage. 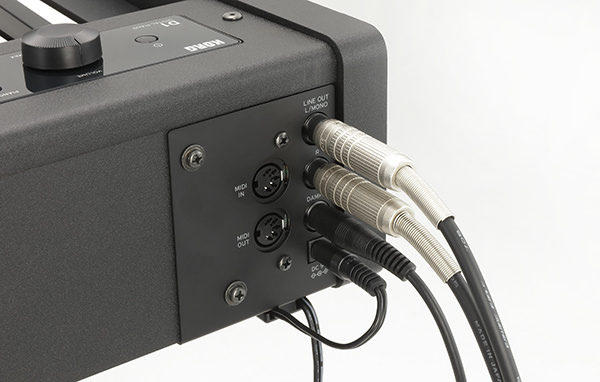 The standard-sized LINE OUT jacks can be connected directly to amplified speakers or to recording equipment. MIDI IN/OUT connectors are also provided. You can connect these via a MIDI interface to your computer, and use the D1 as a MIDI keyboard or as a piano sound module. The music rest that's indispensable for stage performance is included standard, and can easily be attached to the D1. Also included is a compact-sized damper pedal for convenient portability. A dedicated soft case for the KORG D1. 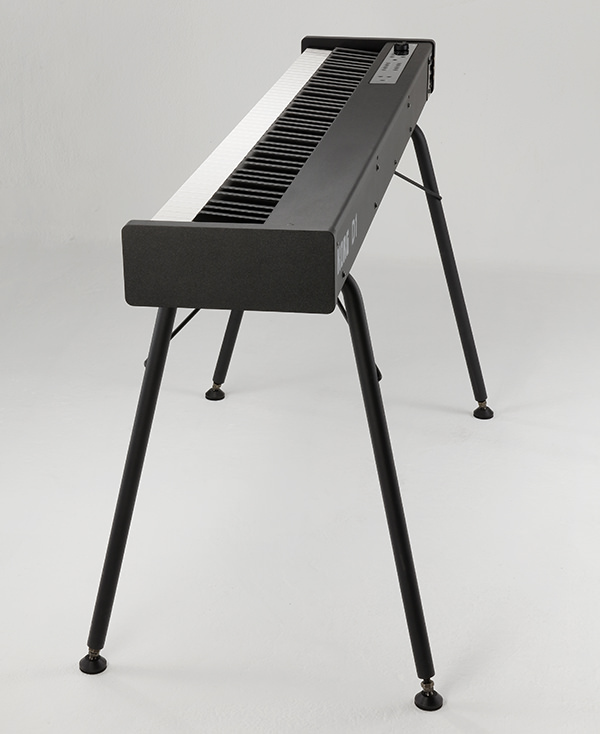 The CONCERT series is a line of pianos that are designed to provide the same performance experience as when listening or playing in a concert hall, in every aspect of sound, touch, and musical experience. This lineup lets you enjoy playing in any situation, from home use to performances on stage.